Home/Transcription Services/EQ Dictation : Smart App For Quick Transcription. Would you believe it if we tell you that you could enhance the overall productivity of your office just by using our transcription services? Yes, outsourcing helps you focus on the tasks that matter most and helps you re-discover your productive self. Our team at EQ Transcription felt that today’s technology is about carrying the world in your pocket. Think about it- the best gadgets are ones that you can comfortably hold in your palms, smart phones are small yet powerful and ‘mini’ as a word is no longer taboo; in fact it’s fashionable. In much the same way, applications or apps have made our life easier. You can now connect faster with friends or get an instant booking at that restaurant you’ve been dying to try out, without having to get up from your chair. That got us thinking as well. We put our heads together and thought about how we could make sending audio files faster and easier. Sure, our instant file uploading service that can be found exclusively on our website is a big hit with customers but wouldn’t it be better and more convenient for our clients who are spread out all over the world if they could upload audio files with just a tap of one finger like others? This got us thinking – was it possible to develop an app that would make recording and uploading audio files faster and easier for you? That was the challenge we took upon ourselves and that is how the EQ Transcription app named EQ Dictation was born. You can turn your smart phone or device into an instant recorder. 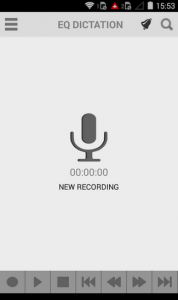 Send files directly to us for transcription from your device. Jot down any notes you’d like us to see with respect to formatting. Want your transcripts by a specified deadline? Let us know! You get an overall view of all our online services. Need some help from our customer desk? Just a single tap will do. And here’s the best part- We have a dedicated team to track any transcription requests that reach us through our mobile app, so you don’t have to be worried about whether you will get your transcripts on time or not. Consider it done! If you’re ready to experience just how easy outsourcing transcription work can be then head here to download our app from the Play Store. You can also download it on App store from here.